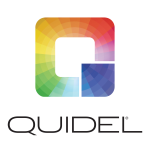 Quidel's products provide healthcare professionals with accurate and cost-effective diagnostic information at the POC. They sell their products to professionals for use in physician's offices, hospitals, clinical laboratories, and wellness screening centers. Their products are focused substantially on family health in areas such as pregnancy, infectious diseases, general health screening, oncology, bone health and autoimmune disorders.